And Here’s What You Missed On Healthcare! On Monday – The Congressional Budget Office – a nonpartisan group that calculates the impact of proposed legislation – said the so-called Better Care Reconciliation Act would leave tens of millions more Americans without coverage in the next decade, but it would also save the government a lot of money. That didn’t help convince any Democrats to back it. But – surprise – many GOP senators aren’t pleased either. On Tuesday – The Senate delayed the vote on its healthcare plan until after the July 4th break. As a reminder, the plan includes things like a cap on federal funding for Medicaid and a temporary freeze on Planned Parenthood funding. It keeps the rule that insurance companies can’t arbitrarily raise prices for people with pre-existing conditions, but has a caveat that could still increase certain healthcare costs for them. Some say the bill doesn’t do enough to roll back Obamacare. And others are worried cutting funding for things like Medicaid and Planned Parenthood would hurt the Americans who need it most. On Thursday – Senate GOP lawmakers are adding some extra money to their healthcare bill to help fight the opioid crisis. In recent years, the number of people in the US who have become addicted to opioids (think: heroin and prescription painkillers like oxycodone) has gone way up. Especially in rural parts of America. Cutting how much money states get for Medicaid would mean less money to spend on helping people fight addictions. Many Senators from both sides of the aisle – especially from states hard hit by the opioid crisis – are not down with this. So now, the GOP’s adding $45 billion to their bill specifically for substance abuse treatment. Governors on both side of the aisle say this isn’t enough. Today – GOP Senators are going back to the drawing board, with new amendments and negotiations, some of which include a repeal and replace-later plan. Which means they’ll wait for another CBO review before putting version 2.0 to a vote. Now – Senators are heading home for a week of recess, aka district work period, and they need to continue to hear from you. 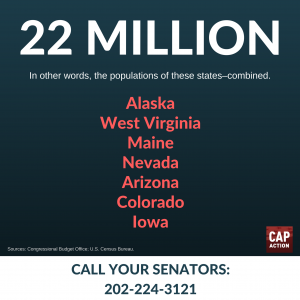 The Senate made a last-minute decision to delay the vote – all because of nurses like YOU, joining with others across the country, calling every single day to speak out for your patients and the 22 million people at risk of losing their health care. But a delay isn’t a victory. And your patients deserve a victory. Even if you’ve already called – even if you already know where your Senators stand – we need EVERYONE to call again. We’ve seen what can happen when they think we’re not watching: when this bill was in the House, there was a delay just like this week’s delay in the Senate, and lawmakers saw that the calls were slowing down. Just when their constituents let up on the pressure, they rushed their bill through to pass by the thinnest margin. We absolutely cannot let that happen again! Author ANA Capitol BeatPosted on June 30, 2017 June 30, 2017 Categories ACA, AHCA, BCRA, Congress, Gun Violence, Health Care, Opioids Addiction, SenateLeave a comment on And Here’s What You Missed On Healthcare! Today, Senate Republicans revealed their answer to health care reform by introducing legislation entitled the Better Care Reconciliation Act of 2017 (BCRA). This is the Senate’s response to the House passed American Health Care Act (AHCA). The 142 page proposal, drafted by 13 Republican Senators under a veil of secrecy, would dismantle the Affordable Care Act and result in a loss of health care coverage for millions of Americans. Republicans and Democrats have already expressed opposition to the bill. The response from providers, consumers, and industry was swift. While the Senate made changes to woo moderate Republicans within the caucus, they amounted to little more than window dressing. •	Tens of millions of Americans would lose health insurance coverage, while millions more would see their premiums and out-of-pocket costs rise. •	Medicaid expansion would be rolled back over a 3 year phase-out period for expansion states between 2020-2023. •	The Medicaid program would be fundamentally restructured to a per-capita or block grant funding structure – shifting costs to already overburden state budgets. •	The Medicaid inflation rate would tied to the Consumer Price Index after 2025, an even lower growth rate than the House-passed bill. •	Waivers would allow states to undermine protection against discrimination for those with pre-existing conditions. •	And more than 2.4 million women getting care at Planned Parenthood clinics across the country would see their access to services disrupted. The bill defunds Planned Parenthood for a year. For a more detailed summary and a side-by-side comparison of the Senate and House bills read our Health Policy one pager. 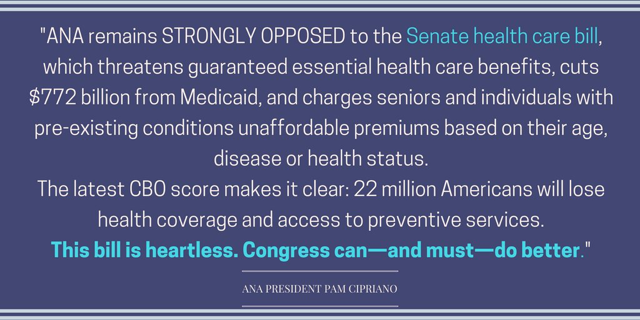 As the Senate prepares to vote on this legislation next week, ANA will continue to fight for a better solution for health care, one that matches ANA’s core principles for health system transformation. Lastly, it’s more important than ever for the Senate to hear from nurses. We’ve made it easy for you to call now! If we don’t make the phones ring off the hook, this bill will become law. And your patients will pay the price.